A big problem is all the Obama holdovers dotted around the administration and government agencies. The amount of obstruction taking place is mind boggling, and it includes high levels of criminality. The President seems to be doing what he promised, but it is going to be a slow process. There are still clandestine forces in play who are trying to remove him from office using nefarious means. #BREAKING Under the new Trump order, illegal immigrant families will be allowed to be kept together during legal proceedings, when the safety of the children can be guaranteed. Well done President Trump for overturning that nasty Bush/Obama law! But you seemed to think on page 1 that this was necessary to keep the borders safe. Trump has now opened the borders and the destruction of all western countries is nigh following your fanboy logic. Expect a Fox News link presented as irrefutable evidence and that we should all go ‘fair play that’s told us’ very soon. He’s neutral. He deals in facts. The ones exposed by every alt right website he quotes. Yes, it is a deterrent the way the existing law is framed, as people were using kids to circumvent the law. That's why he wants to do a new deal! Build a wall, no more catch and release, prosecute illegal entry, i.e. control the border as per his campaign promise! And now the democrats are playing political football over the issue. They don't care about the kids, they are just using them as a political weopon. Ignoring all the brickbats for a moment. There was a very interesting piece on Radio AM just now. I cant be bothered to go into every detail - but the upshot of this is that the democrats have been positioned (due to their political stance on this) now become the party of 'let them all in' regardless , no checks etc - just let them in, which the correspondent seemed to think will work out very well in favour of Trump at the mid term elections coming up. Even though he is not a well liked President (no sh1t) , the economy is booming, jobs have been protected, unemployment is at an all time low etc. The downside being, like any o'level economics kid will tell you - the tarifs and more expensive goods has allowed inflation to creep in - currently running at 3% - which wont be sustainable for ever. Anyway back to the original point. I agree about their economy doing well, he inherited a very good economy much like Labour did in 1997. Anyway there’s hope that he’ll avoid hell as he’s decided that separating kids from their parents was perhaps not the nicest thing . The existing 1997 law has a 20 day limit and the democrats wouldn't change it because of political points the scoring. The new executive order removes that limit, so that the children can stay with their parents until their case is resolved, which they couldn't do under the Bush/Obama legislation. There was a very interesting piece on Radio AM just now. I cant be bothered to go into every detail - but the upshot of this is that the democrats have been positioned (due to their political stance on this) now become the party of 'let them all in' regardless , no checks etc - just let them in, which the correspondent seemed to think will work out very well in favour of Trump at the mid term elections coming up. Even though he is not a well liked President (no sh1t) , the economy is booming, jobs have been protected, unemployment is at an all time low etc. 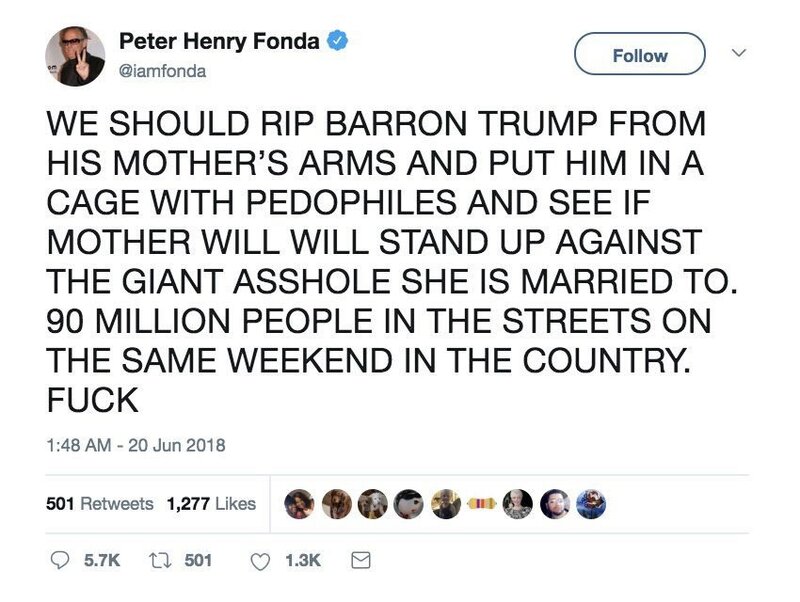 Trump's The Art of the Deal beats Alinsky's Rules For Radicals every time Before you know it, the Democrats will be nominating Peter Fonda as their presidential candidate! The forced separation policy was introduced by Sessions in April this year. When you see Trump or anyone else, including in this thread, blaming anything and anyone other than that, it is a complete lie. This is well documented. The way to stop it, as was said many times, is by Trump signing something and that is exactly what happened. It needed no input from anyone outside the trump administration. You will find the law was passed in 1997 by Bush, and it is only for valid for 20 days, hence Trump wanted to fix it, but the Democrats said feck the kids, they prefer to play political games. Get your facts right buddy. The whole thing is a ruse to stop any ammendments to immigration law, i.e. they want illegal migrants to stream in by the millions, as they did in Germany. Bush was Governor of Texas in 1997. Bush became President in 2001. Get your (really really really) basic facts right buddy. In 21 years, this only became a problem with Trump's policy change because the law never required family separation. Saying it needs Democrats to change it was a lie, and that's been proved by Trump signing an executive order to do exactly that. You are both wrong about the US economy. It has improved slightly since Trump came to office but real unemployment remains above 20%. I posted in another thread here all Trump's quotes since 2012 stating how fake the numbers are. Now he's bragging about 'the greatest economy ever' which he knows is a lie yet is not shy of repeating. I think you've embarrassed yourself enough now, Gluey. Pissgate, Trump Russia Collusion, Stormy, Trump Foundation, Childrengate, so what's next? We need more outrage lardy! Anyway, all's well that ends well! Yeah, can't come across as being unsympathetic, we've got to show some compassion to lardy and friends who have had a very traumatic week! Why do the Democrats want to give their country away? It's going to backfire for them in the November mid-term elections. Thank goodness there are people in this world who still have compassion and care for those less fortunate than themselves. Only right wing fascists and racists could make jokes about the suffering of children. It's a Democrat game, don't fall for it. Kids were strapped up naked with paper bags over their heads on Obama's watch. Why are you explicitly trying to pin it on the right? No, you've got it wrong, Gluey's a socialist, mind you he thinks the Democrats are socialists as well. Not really, I just deal in facts, who is doing what etc., How about you, are you a fanboy? Facts? Just saying things doesn't make them "facts". Don't you mean a factualist? Remember the time I told you Senator John McCain was a wrong 'un?